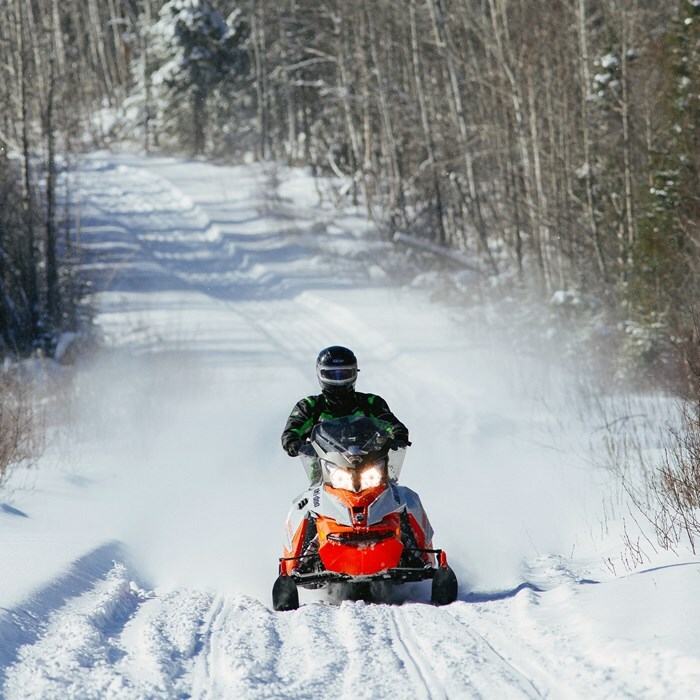 Sometimes a new sled model goes unnoticed and yet, among those who get a test ride, it’s a silent hit. 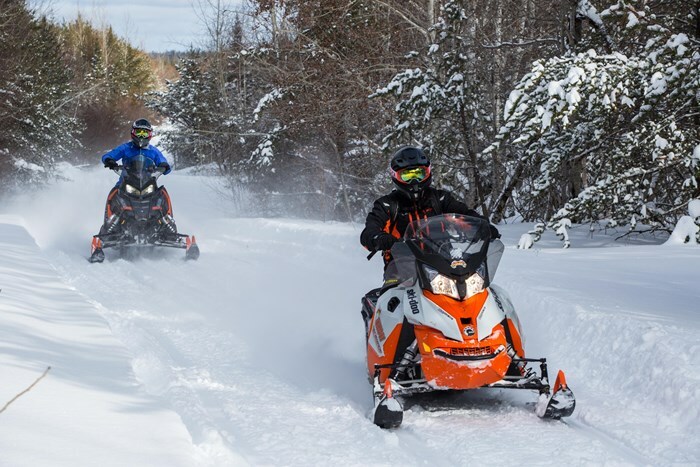 When Horwood Lake Lodge owner, Mike Brazeau asked Mikey’s Team to choose which sleds to consider for his rental fleet for winter 2017/18, they brought him a 2017 Ski-Doo Renegade Backcountry 600 HO Smart choice Mikey’s, well done and thank you. Why build yet another model? 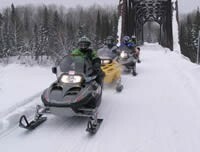 Yes, the DNA of this sled seems to be like every other “off trail” Renegade in the XS platform, but it’s actually built off of the XM platform (web shows XM on tunnel, our sled had XS on tunnel). So why build it? 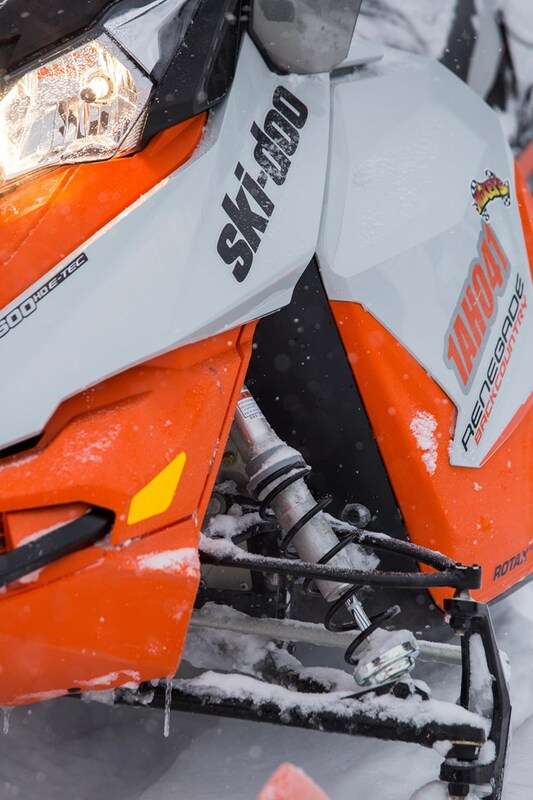 Well, Ski-Doo seems to have created a hybrid with the best of the epic trail version 137” Renegade and mated them with features found on their Summit models. 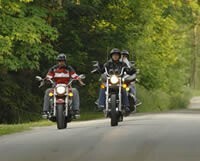 This model truly bridges the gap between riders like myself that often stand-up and jump, and my baby boomer mentors who prefer to sit on a comfy seat and (try) to keeping up with me! 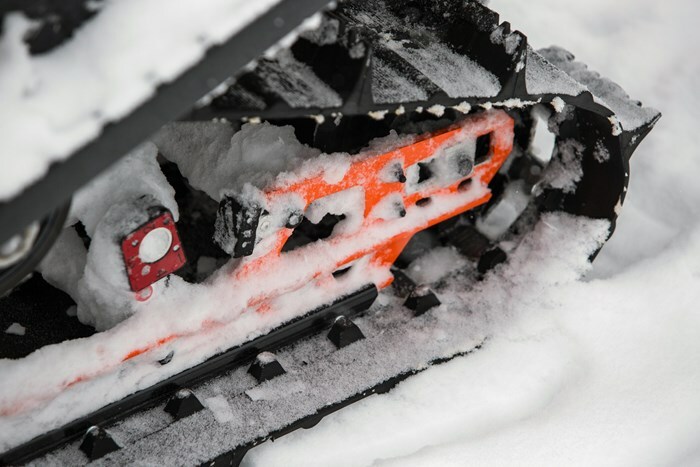 Designed for boondocking or trail carving, Ski-Doo added open running boards that let snow release and fall through as well as added solid footing. The running boards also provide an extra 20cm/8” of added foot room, and the running board edges put you right in front of the steering post for more leverage. The rear skid is the T-Motion (instead of SC-5 on the Sport model, or R-Motion found in the X package) that flexes laterally. It has the Flexedge track and uses the better RAS2 Front Suspension. I’m also happy to report that they went with the Pilot DS2 skis that float perfectly in Northern Ontario conditions. Watching Mike Brazeau Rippin’ It! Right away, hopping on to start it and back it out of the trailer, I noticed not just the colour, but also the wider, comfier seat. In fact, I told Mike that if he chose to buy these he may want to swap out the seat for a narrower version on his personal sled. I doubt he’ll do it though—that seat is comfy, easy to move around on, and he rode on one knee with ease! For a fella that hasn’t ridden a full day of sledding in 16 years—all his riding stories are from the late 70’s and 80’s—that guy can ride! He started us on his “6-Mile Trail” that had been brushed in the fall for Quads, but there was a tonne of fallen trees and deep bush pow on the narrow trail! Seriously, Mike ripped all day long with us, off trail as much as possible, as fast as possible (on his private groomed trails), and he didn’t skip a beat! 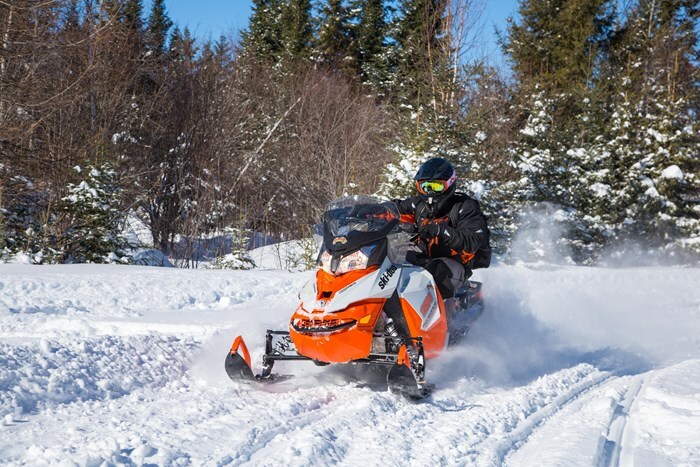 Mike tried and tried to get this sled stuck in the Winter ’17 Timmins-area conditions but he couldn’t. He didn’t notice that I had even “brrraaappp’d” a few Summit holes off trail where we were turning around to do photo and video shoots for an article about Horwood Lake Lodge. Still, he didn’t get stuck. And at the end of the day I picked all the little branches and cat tails out of the nooks & crannies so that Virgil could get some close-ups of this dark horse. It got ridden hard! Well I had to take it for a rip! Did I ride it even half as well as Brazeau did Team What a Ride? It was comfy, cornered perfectly and inspired confidence. Easy to ride and easy on fuel, even with Mike’s heavy thumb. 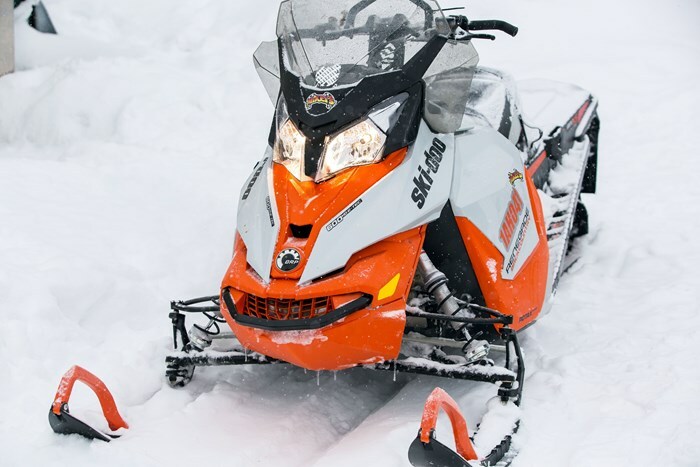 It will make a great sled for the Horwood Lake Lodge Rental Fleet. And it looks great! My final thoughts on this sled are that really, this is our mom and dad’s version of the Freeride, no joke. Niche market hit. Now go tell your parents!! Thanks to Klim for keeping us dry, warm, and safe! This is “Random” Ryan Tarrant saying thanks for reading! Check out and like my Facebook Page if you’re interested in more upcoming wrenching tips, sled reviews, the future of riding and our destinations, and posting your own stories and picture!